11 by 14 Freeway Poster to save and print, or take to your printers. Choose "Fit To Page" printing option for regular 8.5 by 11 paper. 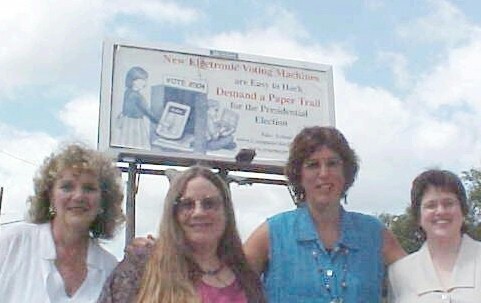 Fund billboards in your city or town alerting people to the hazards of paperless electronic voting. A group of women activists in Austin (including our Chairman Vickie) created a graphic and message for seven billboards which were posted around their city for a month. The message was: ELECTRONIC VOTING MACHINE: EASY TO HACK! INSIST ON A PAPER TRAIL FOR THE PRESIDENTIAL ELECTION! The graphic included a picture of a woman trying to vote on an electronic voting machine, and a hacker with a laptop sitting behind the machine. The cost of the billboards was $700 per month per billboard; this cost probably varies across the country. COPY THE AUSTIN GRAPHIC! To get the billboard graphic e-mailed to you, please contact Susan Bright at Sbright1@austin.rr.com. "NO PAPER = NO PROOF!" 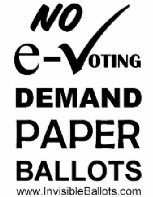 "PAPER BALLOTS, NOT VAPOR BALLOTS!" 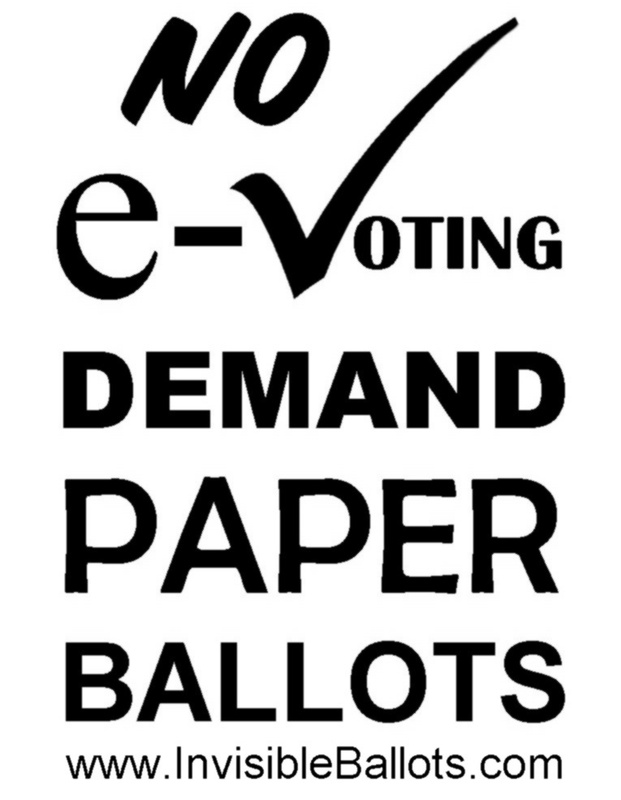 Contact your county election officials who are still using paper ballots, hand-counted (counties can be found on www.votersunite.org; election officials names can be found on www.blackboxvoting.org and ask them NOT to buy electronic voting machines in order to get federal funds through Help America Vote Act; and tell them there are non-electronic methods for the disabled to have a private vote. National Summit September 30th to October 2nd. THIS EVENT IS FREE AND OPEN TO THE PUBLIC; BRING YOUR FRIENDS!